English : The Soyuz TMA-10M spacecraft is rolled out to the launch pad by train on Sept. 23, 2013, at the Baikonur Cosmodrome in Kazakhstan. The Soyuz rocket launched on September 26, Kazakh time, and sent Expedition 37 Soyuz Commander Oleg Kotov, NASA Flight Engineer Michael Hopkins and Russian Flight Engineer Sergey Ryazanskiy on a five and a half month mission aboard the International Space Station. English : Courtship song of a male parasitic wasp, Cotesia congregata. View of Segovia (Spain) from the Alcázar. 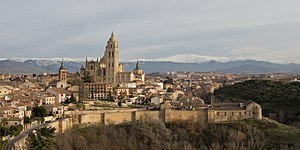 English : View of Segovia (Spain) from the Alcázar. Luhasoo bog in Rõuge Parish, Estonia. English : Luhasoo bog in Rõuge Parish, Estonia. English : Krishnattam is a temple art in Kerala, India. This video was taken at Guruvayur. Batterie de l'Eperon (in Frouard, France): on the left, there is the access to the Counterscarp battery. On the right, there is the access to the gun turret of 155 L.
English : Batterie de l'Eperon (in Frouard, France): on the left, there is the access to the Counterscarp battery. On the right, there is the access to the gun turret of 155 L.
English : A pelagic thresher shark using tail slaps while hunting sardines. English : Lightnings in Belfort (France). English : Icius hamatus on oak. Video taken near Monte Borghetto (about 20km south of Lake Garda), Italy. English : 3D reconstruction of the head of the polychaete Lumbrineris latreilli on the basis of a micro-CT scan. English : Souq Waqif, Doha, Qatar. Sangaste manor main building, built in 1874–1881. English : Sangaste manor main building, built in 1874–1881. English : Jalebi being prepared in a road side shop in Bangalore, India. English : Egg grooming behaviour in the termite Reticulitermes speratus. Butternut squash, cultivar variety of Cucurbita moschata, ripe fruits. Ukraine. English : Butternut squash, cultivar variety of Cucurbita moschata, ripe fruits. Ukraine. English : "Stride la vampa" from Act II of Giuseppe Verdi's Il Trovatore (1853), sung by Gabriella Besanzoni in 1920. The Golden Gate Bridge as seen from the Marin Headlands at sunrise. English : The Golden Gate Bridge as seen from the Marin Headlands at sunrise. English : The Borkumer Kleinbahn leaving Borkum harbour station (Bahnhof „Reede“) in Borkum-Reede, Landkreis Leer, Lower Saxony, Germany. This narrow gauge railway line is a listed cultural heritage monument. 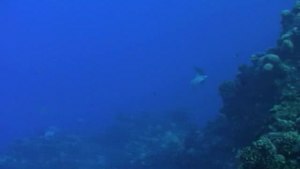 A free swimming Green Moray Eel (Gymnothorax funebris) with diver, Cozumel, Mexico. English : A free swimming Green Moray Eel (Gymnothorax funebris) with diver, Cozumel, Mexico. English : 3D animation of the skull of a young Kemp's ridley sea turtle, based on µCT data. Interior of Prussian Landtag in Berlin, Germany. English : Interior of Prussian Landtag in Berlin, Germany. Sahrawi tribal men performing fantasia at the Tan-Tan (Moussem) Festival in Tan-Tan, Morocco. English : Sahrawi tribal men performing fantasia at the Tan-Tan (Moussem) Festival in Tan-Tan, Morocco. English : A crash simulation featuring female passengers with a low (left) and high (right) body mass index. Castle of Borbeck with outbuilding in the evening. English : Castle of Borbeck with outbuilding in the evening. English : Edward Snowden speaks about NSA programmes at Sam Adams award presentation in Moscow. Gynaephora selenitica caterpillar on meadow vetchling in Estonia. English : Gynaephora selenitica caterpillar on meadow vetchling in Estonia. English : A contest between males of the jumping spider Cosmophasis umbratica. The Wide Field Imager on the MPG/ESO 2.2-metre telescope at the La Silla Observatory has imaged a region of star formation called NGC 3324. English : The Wide Field Imager on the MPG/ESO 2.2-metre telescope at the La Silla Observatory has imaged a region of star formation called NGC 3324. English : A glimpse of the beach volleyball tournament Smart Beach Tour 2013 at Binz, Landkreis Vorpommern-Rügen, Mecklenburg-Vorpommern, Germany. Grisblänkan lighthouse outside Öja island, Stockholm archipelago. In the background, Tiljandersknall lighthouse. English : Grisblänkan lighthouse outside Öja island, Stockholm archipelago. In the background, Tiljandersknall lighthouse. English : Nemophora metallica ovipositing on a flower of Knautia arvensis. Anatomical drawing of a male C. elegans nematode with emphasis on the reproductive system. English : Anatomical drawing of a male C. elegans nematode with emphasis on the reproductive system. English : Jack Andraka, the 16-year-old inventor of a breakthrough cancer diagnostic and winner of the 2012 Intel International Science and Engineering Fair, talks with Francis S. Collins, Director of the National Institutes of Health of the United States, about open access to the research literature. Oka River in Konstantinovo (Rybnovsky District), Ryazan Oblast, Russia. English : Oka River in Konstantinovo (Rybnovsky District), Ryazan Oblast, Russia. English : Macromolecular juggling by enzymes, accompanied by music after Ernst Toch. Tian Tan Buddha, also known as the Big Buddha located at Ngong Ping, Lantau Island, in Hong Kong. English : Tian Tan Buddha, also known as the Big Buddha located at Ngong Ping, Lantau Island, in Hong Kong. English : A fish – the pacific leaping blenny – climbing up a vertical surface of plexiglas. Hungary's Áron Szilágyi (L) fences against Russia's Nikolay Kovalev (R) in the men's sabre semi-finals of the 2013 World Fencing Championships 2013 at Syma Hall in Budapest, 10 August 2013. English : Hungary's Áron Szilágyi (L) fences against Russia's Nikolay Kovalev (R) in the men's sabre semi-finals of the 2013 World Fencing Championships 2013 at Syma Hall in Budapest, 10 August 2013. English : Song of the owl Otus jolandae from Lombok, Indonesia. The Lutheran Cathedral in Helsinki, Finland. English : The Lutheran Cathedral in Helsinki, Finland. English : Headbutting between males of the Green humphead parrotfish. First Cabinet of President Barack Obama in the White House East Room. 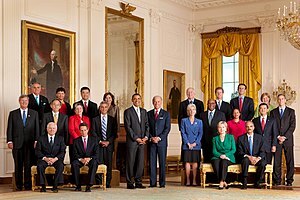 English : First Cabinet of President Barack Obama in the White House East Room. English : Eye tracking while viewing a driving scene. English : Sparrowhawk with its prey. English : A hamster walking. S75-22410 (March 1975) --- These five men compose the two prime crews of the joint United States-USSR Apollo-Soyuz Test Project (ASTP) docking mission in Earth orbit scheduled for July 1975. 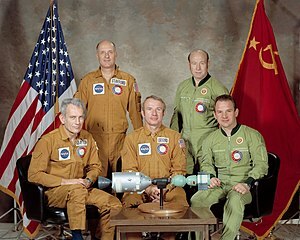 English : S75-22410 (March 1975) --- These five men compose the two prime crews of the joint United States-USSR Apollo-Soyuz Test Project (ASTP) docking mission in Earth orbit scheduled for July 1975. English : American White Pelicans (Pelecanus erythrorhynchos) fishing in a group on a small lake near Corte Madera, California. Castle Neuschwanstein at Schwangau, Bavaria, Germany. English : Castle Neuschwanstein at Schwangau, Bavaria, Germany. English : The tank barge Bea heading east on the Mittelland Canal (Mittellandkanal) in Recke, Kreis Steinfurt, North Rhine-Westphalia, Germany. Row of taxis at the International Commerce Centre, Kowloon, Hong Kong. English : Row of taxis at the International Commerce Centre, Kowloon, Hong Kong. English : Danse Profane, L 103, pt. 2, written by Claude Debussy, performed by the United States Marine Chamber Orchestra with Major Jason K. Fettig, conducting, MSgt Karen Grimsey, harp soloist on Aug. 14, 2010, at the Rachel M. Schlesinger Concert Hall and Arts Center at Northern Virginia Community College in Alexandria, Virginia.